Designed as a high-quality, energy-efficient replacement for 40-watt incandescent bulbs. Reduces energy consumption by over 80% compared to traditional incandescent bulbs. Inviting warm, white light that is ideal for general purpose lighting applications. Verbatims A19 LED bulb is designed as a high-quality, energy-efficient replacement for 40-watt incandescent bulbs. Bulb can reduce energy consumption by more than 80% when compared to traditional incandescent bulbs. Compatible with most commercial dimmers, offering smooth dimming from 10-100% illumination. Ideal for commercial and residential use, the Verbatim A19 LED retrofit lamp provides clear, warm, white light. The lamp has an estimated lifetime of 40,000 hours, resulting in significantly lower maintenance and replacement costs than incandescent bulbs. Available in warm white, 2700K and 3000K color temperatures. 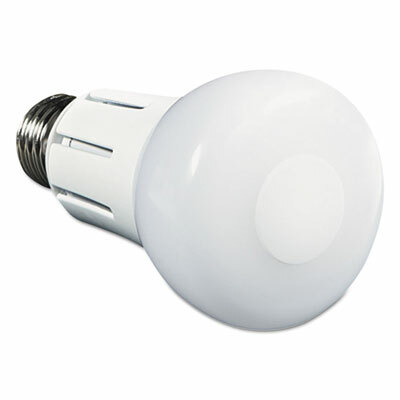 Global Product Type: Light Bulbs-LED Bulb Height: 4.41"
Industry Standard Number: A19 Length: 2.544"